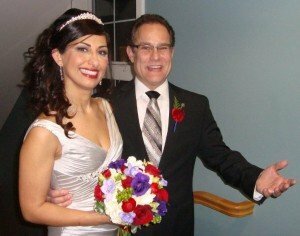 Bernel and Gloria’s Inter-faith Ceremony: Persian and Jewish Traditions & Rituals…And Lots Of Joy! It’s sometimes funny to me what I remember from a wedding ceremony. Minutes before Bernel and Gloria’s inter-faith wedding ceremony celebrating their Persian and Jewish traditions, I stood to the side in the entrance area watching guests arrive. Big smiles. Amazing evening wear with lots of color. So many hugs. People arrived at this evening ceremony in Woodinville on February 19th so happy to be there and thrilled for a couple who overcame many challenges to create such a beautiful and inspiring loving partnership. I worked with Bernel and Gloria to create an inclusive ceremony that wove together rituals and traditions from both backgrounds. Among the many beautiful ceremonial elements, we wove in the sharing of honey, “the 3-time asking,” words from Rumi, the ritual of “sugaring” with Gloria’s girlfriends and ended with a most enthusiastic breaking of the glass! Oh, and let’s not talk about the giggles and joyful laughter that erupted as Bernel walked into the ceremony area with his brother in shackles and with a sign on his back, “please help me!” This was a last minute and surprise contribution to the ceremony by Bernels’ siblings – you gotta love a Groom with a great sense of humor! Comments Off on Bernel and Gloria’s Inter-faith Ceremony: Persian and Jewish Traditions & Rituals…And Lots Of Joy!